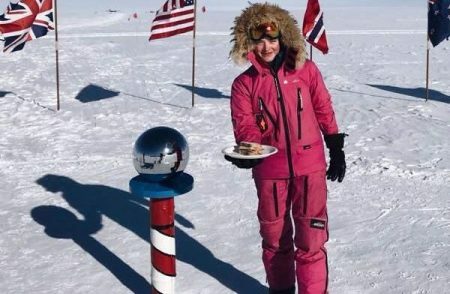 Here’s 16-year-old Australian explorer Jade Hameister who has become the youngest person ever to reach the North Pole, South Pole and cross Greenland, the ‘polar hat-trick’ as we didn’t know it was called. When she was 14 she gave a TEDx talk and men with a certain mindset on YouTube flooded the page with the phrase ‘make me a sandwich’, suggesting her time would be better spent in the kitchen. So when she reached the South Pole, she did this. And here’s what she wrote on her Facebook page. “We spent this morning cleaning out our sleds to be ready to fly out to Union Glacier tomorrow morning (depending on weather). Then we skied over to the Ceremonial South Pole (probably the Pole that everyone knows as the only South Pole – the barbers Pole with the flags) and the actual Geographic South Pole (which moves around 10m each year), which is marked separately. “In the afternoon we were given a tour of the Amundsen-Scott South Pole Station. It is seriously as close to what a Base on another planet would be like than anything else on the planet – a mini-town based around the scientific work of the National Science Foundation.